Follow Bonnie & Clyde's track through the United States. 1933 - Janette Jones Parker is a writer and has taken a room in the Red Crown Tavern in Platte City, Missouri, to write her next novel. She discovers it is where Bonnie & Clyde used to hide, and there she finds a notebook, which ends to be Bonnie's log. Help Janette to decipher the strange message left by Bonnie along her journey. Go through the United States, on the tracks of the two outlaws. 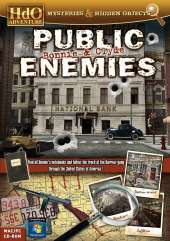 Follow the tremendous adventure of the '#1-public-enemies-couple', reconstitute the logbook of their adventure, and discover the secrets of their map. Use the Hint: a shiny halo helps you to find one of the objects. No more hints? Not enough time? Find the bonus stars hidden in the scenes to get more hints or time! Magnificent sets: Examine meticulously the various places of passage of the two criminals: a hotel room, a bar, a garage, a camp of refugees, banks, etc. In the respect of the style of the 30s. Features: 47 places to observe; Mini-games - re-build a firearm, decode messages; 2 game modes - Classics and Time Attack; Search of objects (list, identical objects); Magnificent sets - high resolution images.